Kids just love sidewalk chalk. And why shouldn’t they? It is so fun and colorful and can be used in a wide variety of summer fun activities. Adults love it because it is inexpensive, often as cheap as a dollar at your local dollar store. A big box of sidewalk chalk can last you all season, and help your child get creative while enjoying some time outdoors. 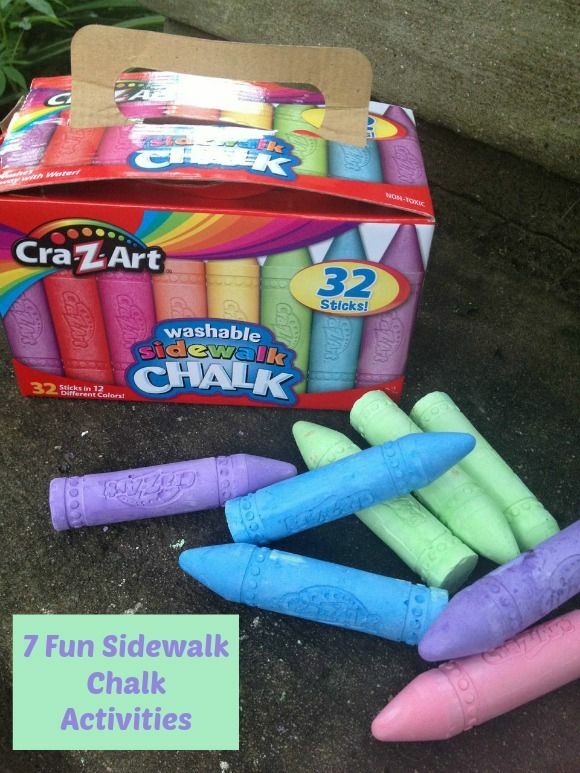 If you have a box of sidewalk chalk but aren’t really sure what to do with it, take a look below at 7 fun ways to use sidewalk chalk in your summer fun activities. You may just be surprised at some of the fun and frugal uses for it. Take a look! Draw a large number line and let your kiddos jump on the numbers as they count them. Then try doing addition and subtraction. Solve an addition problem by standing on a number then giving the child the amount to add. They will jump that many spaces, landing on the answer. Draw a wide variety of shapes in various colors on the driveway. Then, call out a shape saying either Simon Says or not. If you say Simon Says, then everyone has t find that shape to stand on. If they do it without you saying Simon Says, they are out. Go outside during high sun and trace your shadow. You can go out during various times of the day if you wish and notice how the shadow changes as the sun moves! Kids will love this activity and it is a great science concept to learn. Have children re-create some of their favorite artists work on the sidewalk. Give them plenty of colors and look at examples online or in books to get inspired. Have them showcase their murals to each other, friends, neighbors, etc. 5. Write a love letter. Have children write a note to a parent or friend on the driveway using their sidewalk chalk. Nothing will be more meaningful than this giant and colorful expression of their love. Have children draw a neighborhood map or a map of their house on the pavement. This is a fun geography lesson as it is important they know how maps work and why we need them. They can even try drawing a treasure map if they wish, leading a family member or friend to a treasure they have tucked away. So fun! As you can see, a box of sidewalk chalk is good for a lot more than just playing hopscotch! Give these summer fun activities using sidewalk chalk a try and see how easy it is to let loose and enjoy the summer season. All you need is a box of chalk from your local dollar store and you are all set to go. Have fun! Looking for more summer fun activities? When you’re done creating masterpieces, how about wiping them out with some fun water balloon activities? My great-niece loves to play with sidewalk chalk. I love the walk the line one ~ I can just imagine how fun that will be to do with her! Pinning this! Thanks, Robin! My kids just love sidewalk chalk, too! Have fun! These are such cute ideas and I can’t wait to try them with my cute nephews when they come over! Thanks! Thank you so much, Helena! You nephews will have a blast! This sounds like fun. Will do this with the kids this weekend. Great, Liyah, please let us know how they enjoy the sidewalk chalk activities! Thank you for this! My 4 yr old LOVES chalk! Awesome!!! My kids love chalk too!